Goes together like Roast Pheasant and a lukewarm Natty Ice. One way to make yourself a classic convertible is to cut out the middle of a Chevy Lumina and graft in the body of a 1939 Mercury Convertible. 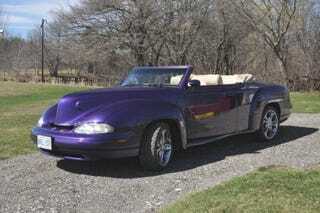 Then paint it purple and add lots of 80s Mercury badging. Not a good way, mind you. More of an”Eye-Searing Horror That Causes Involuntary Rectal Bleeding” sort of way. Every angle of this thing is horrible. There’s isn’t a part that doesn’t look like a crime against basic automotive design. But at least you’ll have the very best of 1990s front wheel drive GM technology to power you along. So, if after looking at the photo below of a stock ‘39 Mercury convertible you decide you’d rather have this rolling horrorshow, you can buy it for only $47,999.00.